Newly empowered Republicans are promising to challenge President Obama’s agenda on the environment, particularly his administration’s proposed regulations to sharply cut emissions from coal-fired power plants and construction of the Keystone pipeline. 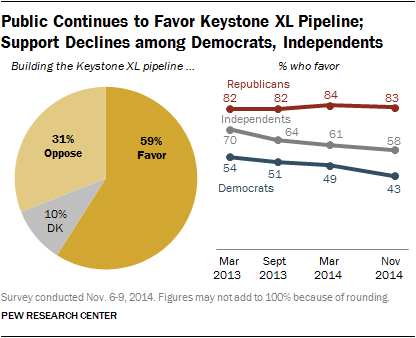 Public opinion is on Obama’s side when it comes to limiting emissions, but the GOP is in sync with most Americans on Keystone. 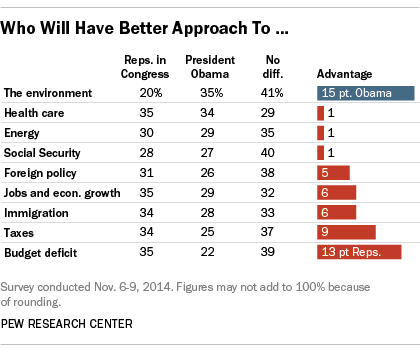 Broadly speaking, Obama has an advantage over Republicans when it comes to environmental matters. The environment is the only one of nine issues tested in a post-election poll where Obama enjoys a clear edge, with Americans favoring his approach to the subject over that of the Republicans by a 35% to 20% margin. About four-in-ten (41%) see no difference between the two. Republicans have talked of forcing a decision on the Keystone pipeline – a decision that Obama has delayed – by approving legislation requiring the president to approve it. About six-in-ten Americans (59%) favor building the pipeline to transport oil from Canada to Gulf Coast ports, while 31% oppose it. However, overall support for the pipeline has slipped seven points since last year, a trend driven largely by declines among Democrats and independents. Democrats are internally divided on the issue, with 45% opposing it and 43% favoring it. 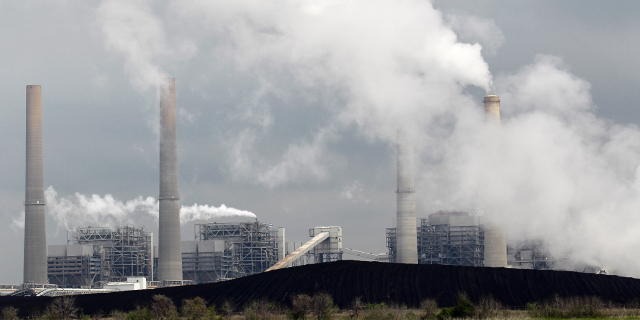 Soon-to-be Senate Majority Leader Mitch McConnell, whose home state of Kentucky is one of the nation’s top coal producers, has made clear that the coal plant emissions limit will be a major target. However, the emission rules have substantial support among Americans with 64% favoring stricter limits in order to address climate change. 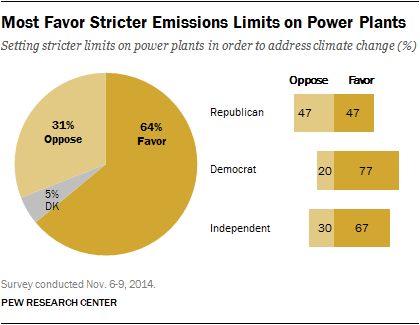 Republicans are evenly divided on the issue, with 47% each favoring stricter limits and opposing them.